Historic cabins tucked in the beautiful West Boulder Valley. Two bedroom main cabin and an additional sleeping cabin with bathroom. Sweeping views of the West Boulder Valley and up into the mountains. The main cabin has wireless Internet access. This property has a 5 night minimum stay. Brief Description: These lovingly restored antique log cabins are tucked away in the West Boulder River Valley South of Big Timber, where they enjoy outstanding views of the nearby Absaroka Mountains. The main cabin and sweet guest cottage look quite rustic but are, in fact, polished and comfortable. The renowned Montana builder Terry Baird paid great attention to the details that make a cabin special. He built this as a retreat for his own family so it received extra TLC. (You can see photos of these cabins and others that Terry has built in the book Old Wood New House.) The workmanship is first rate and the cabins are nicely decorated. 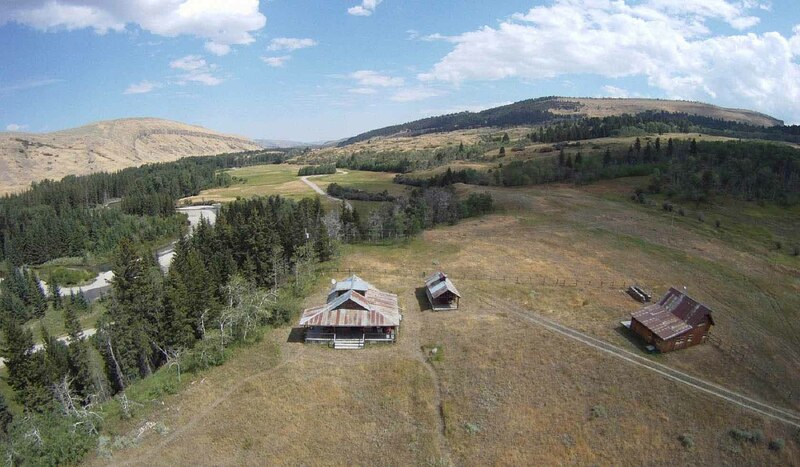 It's a great spot for anyone who loves to hike, fish and see wildlife, and it's also a tranquil & comfy retreat in the heart of some of Montana's prettiest country! Bedrooms and baths: There are two bedrooms in the main cabin and one in the guest cottage. The main cabin has a bedroom on the main floor with one double bed and upstairs there is a bedroom with three twin beds. The main cabin has a bathroom on the main level with an antique claw foot tub and a hand-held shower as well as a Maytag stacked washer & dryer. The upstairs bedroom has a sink. The guest cabin is a nice bedroom with a queen bed and bathroom with a stall shower. Kitchen: This kitchen is made to look very rustic, but it's just built that way. The electric range looks like an old wood cook stove and the refrigerator is hidden behind custom cabinetry. The kitchen is additionally appointed with an electric juicer, coffee maker, toaster oven, blender, food processor, small microwaver & rice cooker. Dining area: The sun porch, just off the living room and kitchen, is a great place to enjoy meals and the views. The table seats six comfortably and there's another table just a few steps away in the living room that will seat four more. If the weather is nice, we bet you'll be enjoying all of your meals out on the front porch. Living room: This is a cozy spot to read or watch movies after a day of exploring. There is a small stereo with CD player and a TV with DVD player for movie watching (no TV reception) and wireless Internet access. The living room also has a card table and a beautiful writing desk. Setting, acreage, and views: The cabins sit on one private acre but it looks like hundreds, as you are surrounded by wide open vistas and there's not another home in sight. All of the surrounding property is part of a large privately held conservation area. Outdoor Amenities: Each cabin has a nice front porch and the one on the main cabin is a great spot for morning coffee, evening cocktails and meals at the table. The cabins have a gas barbecue grill and there is a horseshoe pit in the yard. Activities nearby: Enjoy fishing on the three branches of the Boulder River as well as the Yellowstone River and other nearby blue ribbon trout fisheries, amazing hiking in the Absaroka-Beartooth Wilderness, rafting on nearby rivers, guided horseback riding, a visit to Yellowstone National Park (about 2 hours away) and exploring the nearby towns of Livingston and Big Timber. There's so much to do! Closest town and airport: You're just over an hour from Bozeman's Gallatin Field Airport. It's about 12 miles to McLeod, with a post office and a local watering hole, the "Roadkill Café". It's about a one half hour drive to both Livingston and Big Timber with grocery stores and restaurants.